Matt Forrest Esenwine’s poetry has been published in Highlights® as well as in anthologies selected by Lee Bennett Hopkins, Carol-Ann Hoyte, and J. Patrick Lewis. He is co-author with Deb Russ of the picture book Don’t Ask A Dinosaur, which will be published in Fall 2017 by Pow! Kids Books. He lives with his family in Warner, New Hampshire. Visit mattforrest.com. Fred Koehler won a Boston Globe/Horn Book Honor Award for his illustrations for One Day, The End. He is the author-illustrator of How To Cheer Up Dad, which received three starred reviews, and he is the illustrator of This Book Is Not About Dragons and Puppy, Puppy, Puppy. He lives with his children in Lakeland, Florida. Visit ilikefred.com. 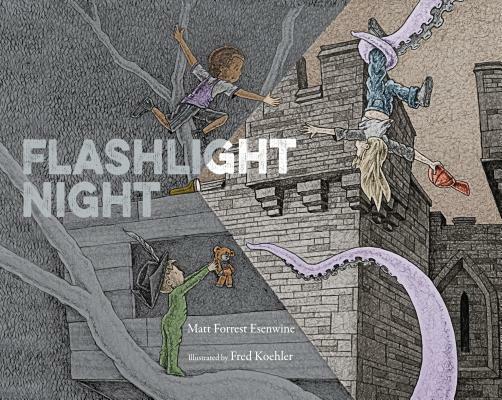 ★"The contrast between darkness and the area illuminated by a flashlight fascinates children, but this title kicks the fun up a notch. Three kids...are heading for a summer sleepover in the treehouse. Wherever the storyteller focuses the (flash) light, the real transforms into the imagined, and the green/gray of night fills with subdued color. The modest swimming pool inspires a pirate escapade; a rope ladder links to a hot air balloon rescue. The delicious language and ingenious metamorphoses, rendered in pencil and colored digitally, are tied directly to classic books stacked near the sleeping bags. A rousing read." – Kirkus Reviews, starred review.